Lighting up the Kazakh Steppe at the Baikonur Cosmodrome in Kazakhstan, three fresh International Space Station crew members launched toward space to begin a two-day chase of the orbiting outpost. Soyuz MS-08 launched at 1:44 p.m. EDT (17:44 GMT) March 21, 2018. 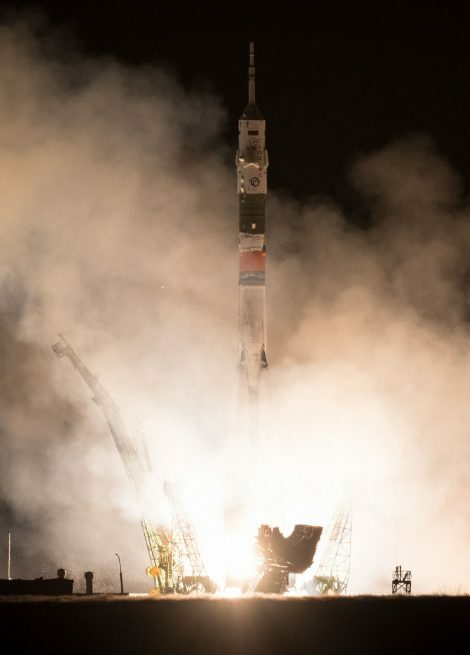 Riding a Soyuz-FG rocket, Russian cosmonaut Oleg Artemyev and NASA astronauts Ricky Arnold and Drew Feustel achieved orbit in just under nine minutes to begin a two-day, 34-orbit rendezvous profile to catch up to the ISS. Docking with the Poisk module is expected to occur at about 3:41 p.m. EDT (19:41 GMT) March 23. 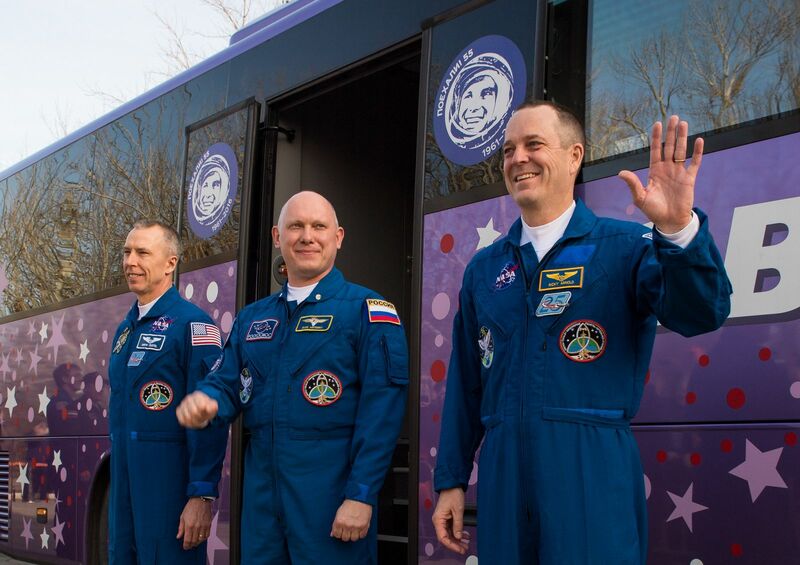 There the trio will join the already-aboard Expedition 55 crew members Scott Tingle of NASA, Norishige Kanai of the Japan Aerospace Exploration Agency, and Anton Shkaplerov of Roscosmos (the Russian state-run space corporation). The run-up to the nighttime launch started with the rollout of the Soyuz-FG rocket with the Soyuz MS-08 spacecraft two days before, on March 19. Transported horizontally by rail, the vehicle made the trek to launch pad 1/5, also known as Gagarin Start—the place where the first human, Yuri Gagarin, launched into space. Once there, the rocket was lifted into the vertical position and umbilicals connected to begin the process of readying the 162-foot (49.5-meter) tall machine for its launch. Soyuz MS-08, call sign “Hawaii,” is part of the latest evolution of the spacecraft (Soyuz-MS) that dates back to its first launch in 1967. It consists of three modules—an orbital module, descent module (where the crew resides), and a service module—totaling 25.5 feet (7.78 meters) long and 8.9 feet (2.72 meters wide). With its solar panels deployed, it has a wingspan of 35 feet (10.7 meters). During their two-day journey, the crew will have a tiny volume of 370 cubic feet (10.5 cubic meters) to live in between the orbital and decent modules. The Soyuz-FG carrier rocket has three stages, which includes its four strap-on liquid-fueled boosters as the first stage. Those boosters are 64 feet (19.6 meters) tall and 8.8 feet (2.68 meters) wide. Each sport a single RD-107A engine that consumes liquid oxygen and rocket grade kerosene to produce 188,500 pounds (838.5 kilonewtons) of thrust for 118 seconds before falling away. Stage two includes the 89-foot (27.1-meter) tall, 9.7-foot (2.95-meter) wide core stage. It is powered by a single RD-108A engine, which also consumes liquid oxygen and rocket grade kerosene. It fires at the same time as the boosters and produces 178,160 pounds (792.5 kilonewtons) of thrust for about 280 seconds. The third stage is 22 feet (6.7 meters) long and 8.7 feet (2.66 meters) wide. It is powered by an RD-0110 engine and consumes liquid oxygen and rocket grade kerosene to produce 66,980 pounds (298 kilonewtons) of thrust. It fires for up to 230 seconds to push the Soyuz spacecraft into orbit. 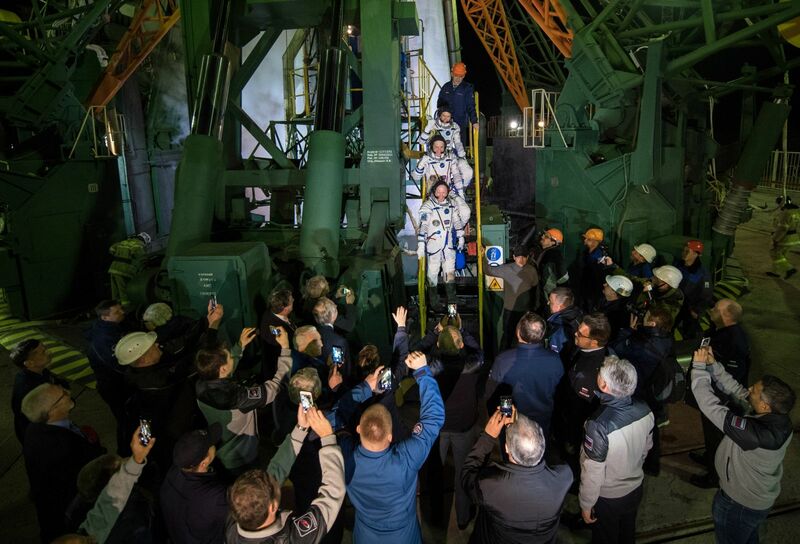 About 8.5 hours before launch, the crew woke up and began their last hours on Earth before their five-month mission. This included eating breakfast, performing various traditions such as signing room door at the Cosmonaut Hotel and being blessed by Russian Orthodox priests, and saying their final goodbyes to friends and family. At about 6 hours before liftoff, the crew left the Cosmonaut Hotel to board a bus bound for Site 254 where they were given final medical checks and helped into their Sokol launch and entry suits. Meanwhile, five hours before launch, the rocket began receiving its rocket grade kerosene propellant and liquid oxygen. This loading was completed before the crew arrived at the launch pad, although it would continue to be topped off as the cryogenic liquid oxygen slowly boiled away. Just over three hours before leaving Earth, the crew departed Site 254 to take the 50-minute bus ride to the launch pad. At 2.5 hours before liftoff, the ground teams began helping the crew into their Soyuz MS-08 spacecraft. Just over two hours before engine ignition, the hatch to the Soyuz was shut and sealed, and ground teams began final system checks on the vehicle. With one hour to go, the pad was evacuated and the crew left alone to wait for the final countdown sequence. To pass the time, music was fed into the capsule. The last song listened to was “Crazy Train” by Ozzy Osbourne. Some 45 minutes before launch, the two service tower halves retracted. This also took away the crew’s launch pad access back to Earth. From this point, should something had gone wrong, the only way to safety would have been the spacecraft’s launch abort tower. However, everything continued nominally. In the final 10 minutes of the countdown the crew members closed their helmets and turned on their suit air, the launch key was inserted in the launch bunker, and the auto sequence began. Forty seconds from liftoff, the third stage umbilical tower retracted. This was followed by the core stage umbilical tower triggering the engine ignition sequence at 20 seconds before launch. It took 15 seconds for the five multi-chamber engines at the base of the Soyuz-FG rocket to throttle to full power. Then five seconds later, the entire stack began rising toward the night sky. One minute, 54 seconds after leaving Earth, the abort tower jettisoned as it was no longer required. Three seconds later, the four liquid-fueled boosters separated. This was followed 40 seconds later by the launch shroud jettisoning to reveal the Soyuz MS-08 spacecraft to space. The third stage continued to burn for just under four minutes before cutting off 8 minutes, 44 seconds after launch. Soyuz MS-08 separated four seconds later and began deploying its antennas and twin solar panels. Soyuz MS-08 was in orbit. For the rest of the crew’s day, they will work to perform two orbit-raising burns on the spacecraft’s third orbit. By their sixth orbit, the trio will go into a sleep period on the tiny spacecraft. On Thursday, the spacecraft will perform another orbital adjustment burn and on Friday, the spacecraft is set to rendezvous and dock with the ISS. Once onboard, the trio will spend five months there before returning to Earth in late August. During their time, they will perform hundreds of experiments and support several visiting vehicle arrivals and departures beginning with SpaceX’s CRS-14 Dragon spacecraft in early April. Their first major task, however, will be preparing for an extravehicular activity on March 29. This EVA will be performed by spacewalking veterans Feustel and Arnold. Combined, the two have over 55 hours of time spent inside a suit in the void of space. Their primary tasks on the spacewalk will include installing wireless antennas on the Tranquility module and replacing cameras on the P1 truss segment, according to NASA. Today’s launch was the 137th flight of a Soyuz spacecraft and the 63rd of the Soyuz-FG rocket, which traces its heritage to the R-7 intercontinental ballistic missile first launched in the late 1950s. The R-7 family of boosters has collectively launched more than 1,800 times—more than any other large rocket family. Additionally, this was the third orbital launch performed by Russia in 2018 and the first human spaceflight of the year.